My sister, brother-in-law and nephew just bought a house and I'm thrilled. Both because this means that I have a new decorating project but also because they are putting down roots close to me and Carter and I'm looking forward to making memories in their new home. 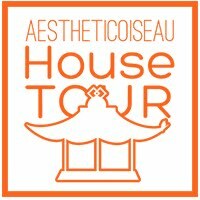 Carter and I were happy to take a tour through the house as they were considering the purchase to help them think about what they could do with the place with a little paint and decoration (and the answer was LOTS). As we walked through the house, I couldn't help but notice many of the attractive traditional furnishings of the current owner. In particular, I really liked two small chairs that were in the home's den. When my sister let me know that the house was a done deal (closing is at the end of the month) I wondered what would happen to those chairs I had seen. The owner is a widower who is majorly downsizing, so I asked my sister if she would inquire about one of the chairs in particular. I have always wanted a small, tufted chair. Although the upholstery on this one is a bit aged, the lines are perfection and I was already dreaming about the possibilities for contrast piping. 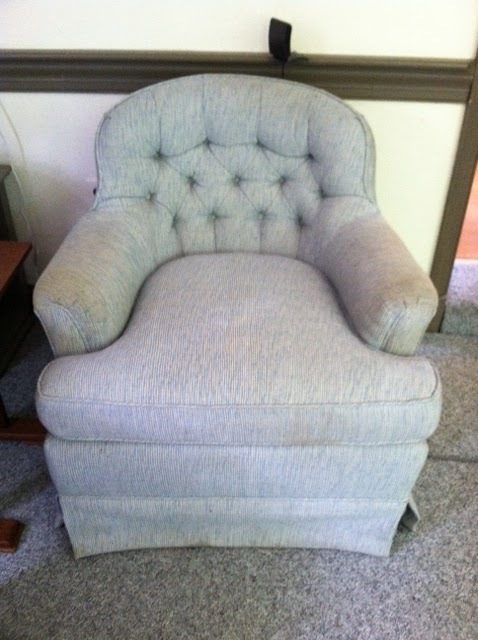 Sure enough, the owner was willing to let it go for $50 so I snapped it up and I'm planning to get it reupholstered. 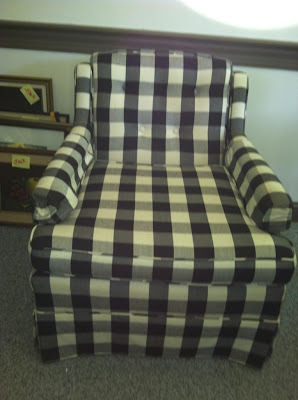 Several days later, my brother-in-law informed me that the family was planning to donate the other chair - a black and white checkered number - and wanted to know if I'd like to have it...for free. Yes. Yes, I would. Sorry for the dinky phone pictures, but you get the idea. We all know buffalo check is way cool right now and I adore black and white so this chair is a keeper. I'm actually thinking it might be a fun addition to our basement renovation, though it's very small in scale which might be a problem. Either way, I love it and I think I might try and keep the upholstery and have the chair professionally cleaned. It's in great shape and from what I remember, the fabric is not showing much wear at all. I know this is cheesy, but seriously nothing brings me joy like giving great old furniture new life. It makes my heart sing. Yes, I said that. And knowing the origin of these pieces gives me peace of mind...I'm happy that my house will now enjoy these chairs that I'm hoping are full of great memories for the previous owners. I am right there with you on being excited about reusing an older piece in a new way. Refinishing, reupholstering, etc. are so much more fun and original than clicking the "buy" button. I love your old new chairs! Who does all your upholstery? I have yet to find someone and have a few items that need attention! Love those chairs! I'm sure they are better made than anything you could buy within reason. I adore the curves and tufting on the blue chair. How cozy to curl up in! Can't wait to see the 'after' pictures.